Barnoldswick Town suffered a seventh-successive defeat on Tuesday night as they went down 2-0 at North West Counties Premier Division leaders City of Liverpool. Matt Barnes’ men were undone by two goals within a minute in the first half. Craig Cairns put the Purps ahead in the 19th minute, and Karl Clair immediately doubled the hosts’ advantage. Town were able to restrict City of Liverpool after that, as they showed the resilience which made Bootle work hard for their 1-0 win at the Silentnight Stadium on Saturday. 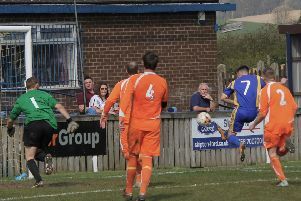 Ryan Cox’s early goal for Bootle ensured the Bucks made it 16-successive wins, thanks to a 1-0 win. Matt Barnes’ side forced the Merseysiders to dig deep for the points, despite playing for an hour with 10 men after the dismissal of Samuel Anankwaa following an incident off the ball. Ryan Livesey at times almost single-handedly frustarted the visitors, but Cox’s ninth-minute strike proved enough for Bootle. Cox latched onto a long ball over the top, before finishing from 25 yards out. Livesey denied Cox a second, before Ste Jones and Carl Peers both fired over for Bootle. Barlick’s hopes were hit after half an hour when Anankwaa saw red, but Town responded well, and Zack Dale twice forced a save from Ryan Jones before the break. Town dug in in the second half, with Livesey keeping out an early effort from Jones, before Cox headed Michael Carberry’s cross over. Livesey then saved well from Peers, before a superb reaction stop to turn over a strike from Cox. Barnoldswick had a let off when Kieran Halligan crossed for the unmarked Jamie Clark, but he side-footed wide from 12 yards. Barlick continued to battle hard, and while it remained 1-0, they were still in the game. And at the death, they nearly stunned bootle when Dale worked a yard on the edge of the atrea, and his fierce drive was superbly turned over the bar by Jones. Tomorrow, Town make the short trip to the Ruby Civil Arena to face Padiham, before they entertain Northwich Victoria on Monday evening.